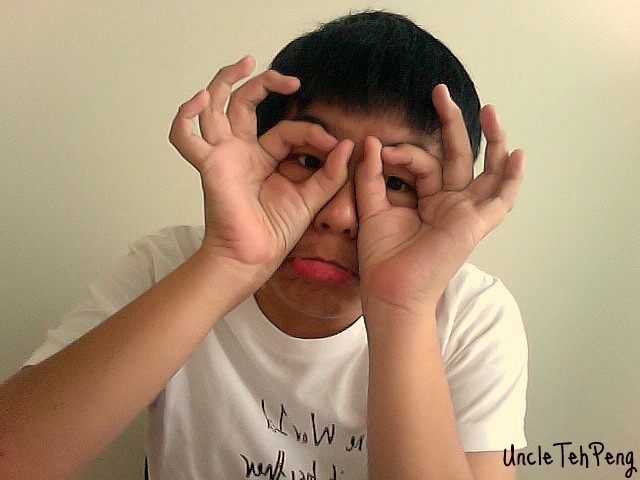 www.uncletehpeng.com : Just be yourself. Hi, I guess this post is going to be very special to me. Please pardon my poor english but I really must say it out, if not I will regret or even becoming more worst. Some of you guys might find this interesting, I'm fine with it. This post is called being yourself, very sure I'm going to talk about myself, so if you guys don't wanna read about it, its okay, because this is actually very personal to be, but I choose to say it out so, i'll feel better. Note: It might mean be nothing much to you, but i guess this is where majority of the bloggers start from, but I can't judge them. Everyone has a different story, and I will share with you in this post. Btw, its about why I'm still so keen to blog. Let's start how I started blogging, I never thought of having a blog because I find it very complicated and messy, but during 08-09 blogging was really a trend. Almost everyone was using it, I didn't commit myself much during 08 because I didn't have time to blog and was super lazy. I have to say that blogging until now has been very memorial because its like my dairy, it would be interesting if you look back your unhappy/happy moments, sometimes you can just laugh at your silly post etc. There are many embarrassing moments, unglam photos, pissed off posts, but isn't that part of blogging too? You can't change someone's interest in doing it, its like you can't choose your own parents, because they still care for you. I didn't expect myself to blog until so long, I was so active during 09-10, you can read 09, ALMOST everyday I blog, lol, I was super "bo-liao". Many things have passed, people change, your old friends are gone, new friends come in. Well, I'm going out of topic already. I'll just skip to the main point. Haters, everyone has it, very common. I have loads of them, sometimes it could be one of my regular readers too. Honesty, I can share with you guys why "they" don't like me. LOL, i'm not venting my anger anyway here this is just how I feel. There could be a lot of reasons why , being "vain" is one of them? Its called being yourself. Who say guys cannot zilian? Its not like illegal for guys to be vain or anything? I just don't get the fact why people still don't like it. Another reason is being desperate for readers, okay I know is wrong to do that or anything, but don't you have to attract people or anything? Come on, don't tell me, imagine if you have a blog, you don't want anyone to know? Of cos having a blog also means I'm seeking for attention. Some of you guys judge my looks, and my attitude towards you guys or just pure haters that really dislike me. The next thing in common, is my nick name. "UncleTehPeng". Where I got this name? Actually one day I was really very bored and decided to change my name to be able to gather alot of attention to everyone. I needed a funny and "dumb" name, so since I like tehpeng a lot, I decided to name myself tehpeng, don't bother about the "uncle" hahaha its just extra to fit in with "tehpeng". From there onwards, I started my youtube account too, . My first video obviously alot of people saw it. Subsequently, I posted even more videos. Why I created this post is because of this video by my friend Miranda. I really suggest you guys to watch this video and read the description part so CLICK the link not only watch the video. SO YEA, HATERS. I have them until to the extend that I almost wanted to close down my account. Okay, I have my own story too, but its similar Miranda's story too. After I posted my first video, there is this group of friends started making fun of me in school and until today they are still doing the same thing. They make fun of my way of speaking, and my nickname. Everytime when I see them in school they will just call my nickname very loudly. The worst was what happen yesterday which make me really wanna do this post, I was in my class. The group kinda of stop making fun of me already expect for 2 person, let's name them "AA and BB" . I got scolded in front of everyone. Despite everyone was laughing at me, I didn't care much because i'm used to it already. AA said something very loud that really offended me. If I'm still not wrong, AA said "Teacher you scold him also never mind because he already disgraced himself to everyone online, he very famous one." BB started to make the thing worst "he earn money through blogging somemore". After that onwards I was super quiet throughout the whole lesson. I'm no kidding its really very saddening to hear that. I was rather offended by it, but I got over it already. Btw, if you know I'm referring to you I hope you really understand because nobody is perfect. Everyone is good in their own way. I'm a person who gets over things very fast, forgive and forget. I really can't be bothered to care about them anymore. I can't do anything its their mouth. I was thinking throughout the whole day yesterday and decided to just move on, because when you start making videos/blogging, confirm I can guarantee, have haters one. Maybe they are just jealous of who you are? Worst come to worst just scold them. But how can your haters last long? Just keep doing what you like now, and just pissed them off so they will be kinda of "too tired" to make fun of you anymore and decided to move on with their loser lives. This is why I'm still standing strong and always.